Terrazza Pure is the perfect weather protection solution to bring as much light as possible to patios in Northern and Central European regions with less sun and more rain – and all in an elegant cubic design. You bring cosy al fresco lighting and unique lighting effects to your customers' patios with the innovative RGB Strip LED bar. Only from weinor: the smallest cassette! VertiTex II is the clever solution for elegant privacy and sun protection on the patio and all over the house. Discover the advantages of the weinor full glass sliding door w 17 easy. 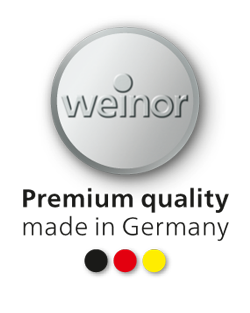 As a customer you receive the weinor certificate of authenticity with your purchased product to certify the originality of weinor products. The weinor heating system Tempura Quadra has received the coveted international design award Red Dot. Be inspired by these successfully installed sun and weather protection projects!